Your Sunday afternoon Madtini refreshment comes courtesy of Los Angeles chef Gaby of the site What’s Gaby Cooking? 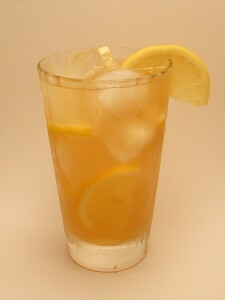 Its the refreshing taste of fresh lemonade kicked up a notch with a dash of two of balsamic vinegar. Try it, you’ll thank me later. Combine the fresh lemon juice, water sugar and vodka. Add a dash of balsamic vinegar to taste. Pour into a highball glass filled with ice. Garnish with slices of lemon.